Buying a Migratory Bird/Duck Stamp is a simple and direct way for people to contribute to grassland and wetland conservation. Here are a few more reasons to buy a Stamp today. 1. A bargain at $15. 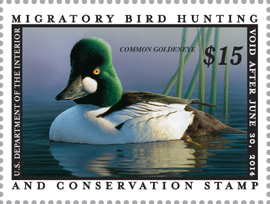 The Stamp costs only $15, with 98% (or $14.70) going toward conservation. And it’s easy to purchase — nearly all large Post Offices, and some smaller ones, carry them. This $15-purchase is perhaps the single simplest thing you can do to support a legacy of wetland and grassland conservation for birds. 3. Save wetlands and grasslands. The funds not only go to refuges. Since 1958, the U.S. Fish and Wildlife Service has used stamp revenues to protect “Waterfowl Production Areas”—to the tune of about 3 million acres—within the critical Prairie Pothole Region to our north. This is vital to birds that migrate through the Playa Lakes region. The very same program protects declining prairie-nesting birds in the face of increasing loss of grasslands. 4. More than just ducks. The funds benefit scores of other bird species, including shorebirds, herons, raptors, and songbirds, not to mention reptiles, amphibians, fish, butterflies, native plants, and more. Densities of grassland bird species such as Bobolink, Grasshopper Sparrow, Clay-colored Sparrow and Sedge Wren, are remarkably higher on Refuge System grasslands than on the landscape in general. 5. Beautiful natural areas. Some of the most diverse and wildlife-rich refuges in the nation have been acquired with Stamp funds. For example, 99.1% of the funds used to acquire Quivira NWR in Kansas were from Stamp purchases. Other refuges in our region supported through Stamp funds include Maxwell NWR in New Mexico (75.5%), Muleshoe NWR in Texas (33.45%), and Salt Plains in Oklahoma (3.5%). 6. A “free pass.” The Stamp is a free pass for an entire year to all refuges that charge for admission. Whatever sort of outdoor recreation you’re into — wildlife photography, birding, fishing, hunting, hiking, kayaking, or just restoring your soul in communion with nature — connecting to a National Wildlife Refuge through a stamp is a great way to do it. 7. A beautiful collectible. The Stamp is a beautiful collectible and a great artistic tradition. Since 1949, the design of each year’s duck stamp has been chosen in an open art contest. By buying and displaying a Stamp you can show that you appreciate long-term habitat protection for all birds and other wildlife. Spread the word, and show that you care! Compiled with information from the Friends of the Migratory Bird/Duck Stamp and Cornell Lab of Ornithology.